Push to Walk, a Riverdale based non-profit organization assembled a team to participate in the NJ Marathon and raised over $18,000. On Sunday, May 1, 2016 in Long Branch, NJ Team Push to Walk raced for its sixth year to show its support and dedication to the non-profit they represented. The team consisted of 19 people, including staff, family, friends, members of the community, and a Push to Walk client who participated in a handcycle. All Team Push to Walk members’ hard work showed in the satisfaction they displayed when crossing the finish line. Each team member committed to raising $500 as a minimum goal for Push to Walk’s program. Push to Walk workouts cost $95 per hour and are not covered by insurance. 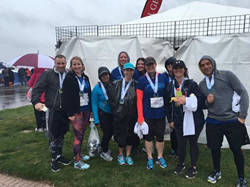 Team Push to Walk proved their dedication this year by not only raising funds for the program, but showing up ready to race in the cold and rain. Race day has passed, but donations continue to come in. The team has already raised over $18,000 with more expected to come in at get them closer to the team goal. Push to Walk is not able to cover all of its operating costs through client fees, but relies on fundraising events to help make up the difference. “Our clients come to us because they see an improvement in their quality of life. We work hard to support our clients by fund raising so cost does not stand in the way of them achieving their goals,” explains Cynthia Templeton, President of Push to Walk. Push to Walk uses exercise trainers certified in methods known to help people regain strength, function and independence and provide one-on-one workouts to their clients. The next closest facilities of this kind are located in Boston and North Carolina. Sponsor the team or an individual by clicking the banner on the Push to Walk website: http://www.pushtowalknj.org. For more information, please contact Stephanie Lajam at (862) 200-5848 or slajam(at)pushtowalknj(dot)org. Founded in 2007, Push to Walk is an organization that provides individualized workouts and resources to people with spinal cord injuries and other forms of paralysis to optimize current quality of life and to prepare for future medical advancements. It is the only program of its kind in the New York- New Jersey area. Push to Walk’s rigorous one-on-one workout approach challenges clients to reach their personal goals and achieve maximum independence, leading to greater success and fulfillment in their personal and professional lives. Push to Walk is only able to cover about 65% of its operating costs through client fees, and relies on grants and fundraising events to help make up the difference. A 501(C)3 non-profit, Push to Walk is located in Riverdale, New Jersey. Visit http://www.pushtowalknj.org to learn more.